15-Sep-2004 -- We headed west from Regina on the Trans Canada Highway about 8:30 am. By noon we had reached this confluence near Piapot after turning south off the Trans Canada on Range Road 223 at Sidewood. A couple of side roads led us west then north where we found open gates and a trail through the fields. Soon we were 475 meters from the spot. Birds darted here and there beside us as we drove along the trail. Grasshoppers leaped out of the grass or rode along on our windshield. Gophers scurried out of the way. We ate our sandwiches and were just preparing to set out when a truck drove up. The lady inside wondered what in the world we were doing so far off the beaten path. We explained our mission and showed her the confluence letter. Along came her husband in his truck so we visited with both of them. They were then off to pick up some of their share of large round bales of hay from the community pasture northwest of the confluence. We crossed a barbed wire fence and had an easy walk through a green grassy pasture to the spot. There were wide open spaces so it was easy to zero the GPS. While we were taking pictures some antelope ran over the hills in the distance. A small hill 300 meters south of the confluence provided a good overview. The distant overview of the area is from the side of the Trans Canada Highway 3.8 kilometers north of the confluence. 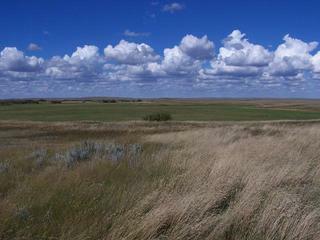 The eastern edge of the Cypress Hills can be seen in the distance. While driving around the area we saw deer and Pronghorn Antelope. As the old western ballad goes: "Home, home on the range, where the deer and the antelope play". The "76" Ranch took its name from the brand used by the Powder River Ranch in Wyoming. When Sir John Lister-Kaye bought the ranch's entire herd of cattle for his land development, he kept the brand and took the name "76". This was the site of the Crane Lake Farm, one of the ten such farms that together made up the "76" Ranch. In 1890, it was made the cattle operation headquarters. Each farm had a two storey house, a bunk house, stable and machine shed, granary and windmill, blacksmith shop, harness room, cattle shed, sheep shed and piggery. The "76" survived the winter of 1906-7, but lost two thirds of its cattle. Its British owners sold it to Gordon, Ironsides and Fares in 1909. In 1921, the "76" Ranch was permanently broken up. The brand passed through a number of owners before returning to this area in 1945. In 1884, Sir John Pepys Lister-Kaye, a Yorkshire baronet, arrived in the northwest from California, bought 7,000 acres of land near Balgonie, and started a farm. In 1886 , Lister- Kaye became interested in the Swift Current area. He bought ten blocks of land, of 10,000 acres each, between Swift Current and Calgary. Each block was one farm; together, they made up the "76" Ranch. In 1888, he formed the Canadian Agriculture Coal and Colonization Company and received financial backing in England. Under Lister-Kaye's management, the company became one of the largest agricultural ventures in Canada. The severe winter of 1890 killed cattle and reduced feed stocks. Lister- Kaye's unorthodox efforts to cover these losses failed completely. The financially-pressed company reorganized and Lister-Kaye resigned as manager. The company continued to operate until 1909 but never achieved the level of prosperity envisioned by Lister-Kaye. While heading east to Gull Lake where we were staying overnight, we stopped in Tompkins to see an old sod house. This sod house is typical of the ones built by early settlers when they first reached the prairies. These structures built of grass sod provided a shelter for a family until a regular house could be built. #1: Overview of the confluence from 300 meters looking North. #2: Looking North from the confluence. #3: The view East from the confluence. #5: Looking West from the confluence. #7: The trail to the confluence heading West. #8: Overview of the confluence taken from the Trans Canada Highway 3.8 km to the North. #10: "Home, home on the range, where the deer and the antelope play."